The warm weather has meant that there have been more interesting outfits out on the street (as well as a few gasp-inducing ones too). There are so many things that I love about this particular outfit - the main one being that she's paired her feminine pleated dress with a pair of victorian-style lace up ankle boots. She found her glorious embroidered bag at a market on one of her travels (I can't remember where, it may have been Iran?) 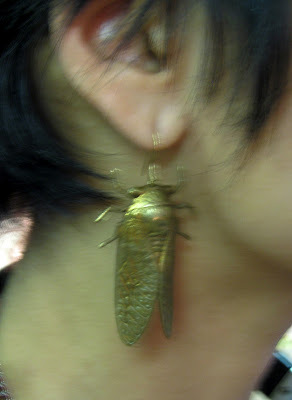 and she is also wearing a stunning pair of brass earrings in the shape of what looks like a cicada. I tried to take a photo of them without much success (see below). I smiled when I saw this gorgeous young lady carrying a bag very, very similar to one I just purchased in NY. Seeing how good it looks, I'm extra glad I got mine. Her earrings are extraordinary, too. Love the whole presentation; she's great. Bug accessories are always welcome accents! I can't believe how warm it is there. This woman looks cool. Such a beautiful wardrobe.....truly modern feminine style....love it. P.S. you are so lucky in the warm sun while we are freezing on the west coast! She looks lovely, especially that fabulous bag. I saw some wonderfully dressed girls in town today and had my camera with me, but felt too shy to ask for a photo. Do you find it easy to ask, and does everyone agree to having their photo taken? And she was at The Sentimentalist! She left with a hot pink tiered suede skirt.